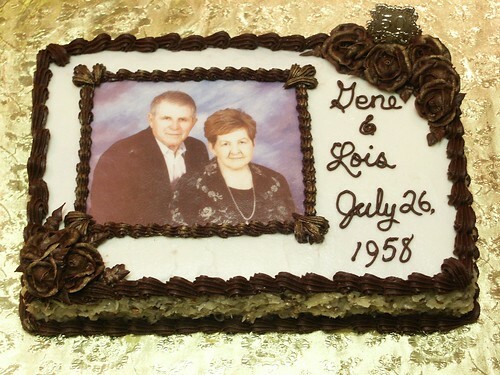 Our friends were celebrating their parents' 50th wedding anniversary. They had already ordered a small scale replica of the original wedding cake, but when additional guests were added to the party at the last minute, they felt more cake was needed. So they asked me to bake a German chocolate "groom's cake". They provided me with an edible image and left the design up to me. I had a general idea of what I wanted to do and I knew that the top would have to be iced with buttercream in order to apply the image. I baked two 9" x 13" German chocolate cakes and torted into four layers. I actually only used three layers, and it's a good thing because I cooked a single batch of coconut and pecan filling and had to scrape the bowl. Anyway, I layered the cakes and filling then iced the top of the cake with a vanilla/coconut buttercream, smoothed the top with a Viva paper towel and applied the image before it crusted. Then I applied the filling to the sides of the cake. It wasn't a thick filling so I had to add additional coconut flakes to get it to stick and not slide down. Then, I mixed a batch of regular Hershey's Unsweetened cocoa frosting and used it to pipe the border around the image and the trim around the top and bottom of the cake. Then I piped their names and wedding date, but the cake was still too plain. So I decided to try my hand at roses. I don't think I've made roses since taking a Wilton class months ago. So I added more powdered sugar and some meringue powder to the frosting to stiffen it up and used a flower nail to make some roses. The frosting was still kind of soft so the petals kind of melted into each other, but they dried rather quickly, which minimized the problem. My friends had provided the gold 50 Years plaque, which I mounted in a rose cluster. Once the chocolate frosting had crusted somewhat, I used a dry brush to apply gold luster dust to the rose petals and the piping that framed the image. Although I'm never truly satisfied with anything I create, I thought it turned out quite nice. And they were pleased, so I guess it was a Mission Accomplished!